Posted on September 9, 2018 by Al B. As of today, the Nature Conservancy web site no longer shows the page referred to below. There is no mention of Mr. Jones, and a search of their listing of scientists, senior leadership, issue experts and volunteer leadership has no listing of Mr. Jones. The web site has some modifications showing the good work they are doing with aquaculture around the world, which I have always supported in the past. Since they have chosen not to communicate with me since my emails and phone conversations of two weeks ago, I am assuming that things have changed there, for what appears to be the better. I am going to leave this original post up, because I am sure that people will wonder what happened to it if I take it down, and I want this post to show that I am asking any of you that reach this page to hold off taking any action against The Nature Conservancy until further notice. Given that The Nature Conservancy had such an interview in place for some time (weeks?) it would be good to see them post a page discussing the controversies here in the Pacific Northwest to show that there are environmental concerns we face, and are looking forward to working with the Nature Conservancy in the future to come up with solutions that can be supported by all of us. So can I buy farm-raised salmon? Mr. Jones does not offer any explanation or overview of the controversy of net pens in British Columbia, Washington State, or Alaska (which has a ban on them). No mention of our Washington’s new ban on farming Atlantic salmon. No mention of massive overuse of anti-biotics to combat diseases rampant in the Pacific off Chile. Also not mentioned is the fact that Norway is shipping diseased fish embryos to North America. No mention of issues with farming shrimp around the world nor the documented slave trade of workers employed by the industry. The Nature Conservancy refused to give me access to Robert before writing this article. In looking at his background on Linked In I find that Robert came from the very agency, NOAA, that has supported farmed salmon with spurious research that only looked at effects of the net pens in the waters under the pens, and ignored disease vectors, effects farther from the pens, sea lice, and the like. Also, it appears Robert Jones has pulled his Linked In resume since my inquiries. To be clear, I am not saying that all farmed fish is a problem. But it is clear that farming Atlantic Salmon has become a serious environmental issue in many parts of the world. It is time to wake up The Nature Conservancy. They have allowed a person into their upper management who appears to be unable to view the environmental problems of the farmed Atlantic salmon industry with a non biased eye. Please feel free to forward this article. Please join me and others in supporting a ban on donations to the Nature Conservancy in any form, until they change this position and offer a balanced approach to aquaculture around the world. Please call your local Nature Conservancy office and let them know you will be donating during the fourth quarter of the year to other environmental organizations. Posted on July 18, 2016 by Al B. In a stunning development Paul Watson of Sea Shepherd offered me a ship and crew to further my work protect wild salmon from salmon farms! The launch of Operation Virus Hunter begins today with a press conference with First Nation leaders, Pamela Anderson and David Suzuki. If you want to follow this voyage I have created a website to allow you to keep track of us and most importantly for you to help! If you see the ship go by please photo and share. This is our chance to speak to the world about the destruction of one of earths rare places that still makes clean water and food. Sometimes government agencies get it wrong. This is one of those times. Now we, the consumers, have to continue to just say no to farmed salmon, and demand wild fish. Only consumers can stop the industry, which has apparently manipulated through it’s lobbying efforts the highest levels of the FDA. This is a bad decision, for the environment, for consumers, and for fish. Why? It’s not that you might keel over by eating this fish. It’s about the entire ecosystem that is created to support this new animal. Have long term studies been done? I’ve not seen any. Has anyone questioned whether the feed and antibiotics that may be needed to support this creature are passed through to diners? Or what their effects on the environment might be under the pens that raise these? 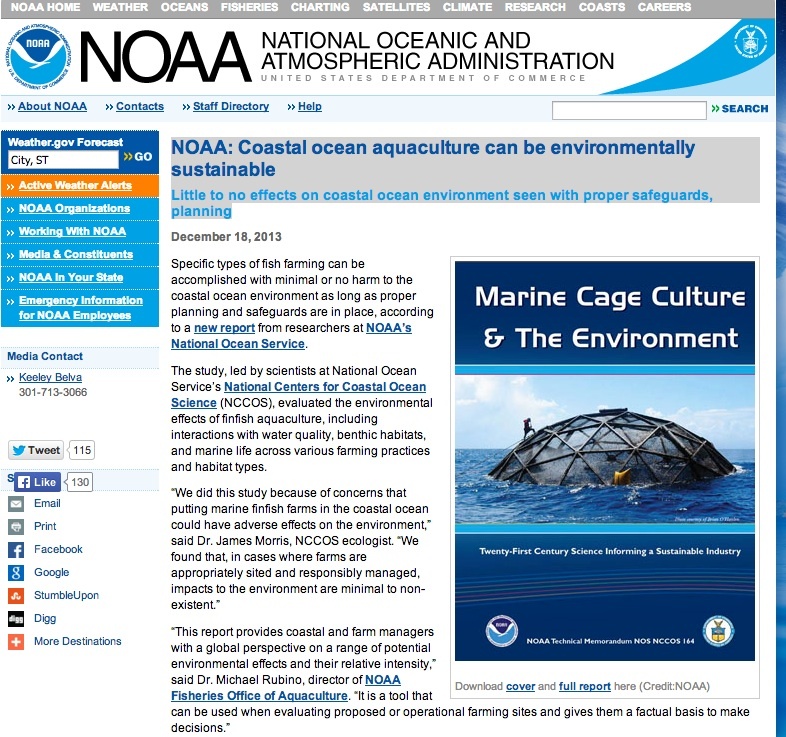 NOAA, which has certified these pens, only looks at the short term effects of the pens on the bottom directly under the pens. The science behind this is skewed in the favor of the farms, not the environment or the consumer. Posted on March 20, 2014 by Al B. Over the past decade, WILD has become widely recognized as the gold standard for quality salmon and other seafoods, and the fishing industry and consumers have benefited when labels are accurate and can be trusted. Occasional packages of imported farmed salmon labeled “organic” in US markets simply indicated the corruption of some foreign certification standards. This would never be allowed by our Department of Agriculture… or so we thought. more momentum on a very slippery slope. information, email Michelle Arsenault (Michelle.Arsenault@ams.usda.gov), NOSB Advisory Board Specialist or call 202-720-0081. * Marine fish farms replicate some of the worst practices of confined animal feedlot operations, known as CAFOs, which could never receive organic certification. *Impacts are largely under the waterline and out of sight, so the fish farm industry has escaped scrutiny that would have closed down comparably dirty land-based operations. Marine netpens allow excess feed, pathogens, parasites, and voluminous amounts of pollution to flush into the surrounding waters, putting other aquatic species at risk. *Farmed fish escape, competing with wild species for food and habitat. More than 613,000 non-native Atlantic salmon escaped from netpens into Washington State waters in 4 years; millions of farmed fish escape world-wide. *The salmon farming industry uses more antibiotics per pound than any other livestock producer and these pesticides, fungicides, algaecides and other chemicals flush from open cages into the surrounding waters. *Several studies have concluded that usage of antibiotics in fish farming increases antibiotic resistant bacteria in our marine environment and in our food supply. The industrial aquaculture production system medicates to the weakest animal and sick and treated fish and seafood sometimes end up in the marketplace. *Use of fish meal and fish oil from wild forage fish result in overfishing of wild fish to feed carnivorous farmed fish. One-third of the ocean’s harvest is herring, anchovies, mackerel and other small fish, which are made into fish meal and oil for fattening farmed fish and animals. The aquaculture industry already uses more than half the world’s fishmeal and more than 80 percent of the fish oil. Rearing salmon, halibut, blackcod and many other marine species is unsustainable because of the net loss of protein. *Standards for organic livestock requires that their feed is 100% organic feed, yet the proposed aquaculture standard would allow farmed fish feed to be 25% wild fish, claiming the forage fish meal and oil will not be “feed” but instead a “feed supplement. Wild salmon and other food fish were previously denied organic certification by the NOSB. *Farmed fish have documented higher amounts of environmental contaminants since the feed concentrates mercury, lead, and persistent bioaccumlative toxins. A study by the Environmental Working Group showed farmed salmon often are the most PCB-contaminated protein source in the U.S. food supply, with an average of 16 times the level of PCBs as wild fish. *“The recommendation acknowledges the human health risks, but would only require them be removed if found to have contaminants in amounts higher than regulatory levels in commercially available fish meal and oil. Thus the proposed “organic” standard would allow the same level of contaminants in fish meal as those permitted by general industrial aquaculture. This provision is a microcosm of the recommendation as a whole: rather than setting a higher bar for organics, and risk losing the ability to label salmon and other predatory fish as “organic,” it merely lowers the organic bar to the existing commercial standards.” Center for Food Safety presentation to the NOSB. *Organic standards require animals to be able to exhibit their “natural behavior.” Wild salmon and other ocean fish swim for their lifetimes, and confining these fish is a direct violation of one of the core organic principles. Anne Mosness will attend the Spring 2014 NOSB meeting, representing the Bristol Bay Regional Seafood Marketing Association (email: eatwildfish@aol.com). While this is not directly related to around here, it does have some interesting scientific findings that are relevant to our own battles against net pens. Read the whole article. It’s quite worth it. Wonder if it’s totally a one to one fit with our fish farming industry? FARMED salmon should be sterilised to prevent them breeding with wild fish and introducing genetic weaknesses that will hamper their survival, experts have urged. New research shows that while salmon reared in captivity to be eaten are genetically distinct from their wild relatives, they are just as fertile and pose a potential danger to naturally occurring populations if they escape and breed with them. Millions of salmon escape from fish farms each year and can find their way into wild spawning groups, where they can reproduce and introduce undesirable traits. Posted on February 4, 2014 by Al B. This came out in December but was just brought to my attention. I think this officially opens a political battle. Prior to this, NOAA was pretty much not actively taking sides in this. With this campaign on their part, they appear to becoming a wing of the public relations people of the fish farm industry. To be clear: NOAA is a huge agency, with lots of different departments, and they are under the Department of Commerce, not environmental protection. This comes interestingly enough, at a time when there is a great deal of criticism of NOAA for it’s policies on net pen aquaculture here in the state. Posted on December 23, 2013 by Al B. Good article about a working alternative to in water fish farms. This is a rated “green” tilapia farm near Sumas. No waste water is sent to the rivers. The way forward? It certainly takes away the arguement that this is an “in-water” dependent business. Have to see if we can get local restaurants to carry the fish. I’d pay a bit more to support this, wouldn’t you? Sumas Lake Aquafarm’s fish are imported as fry and raised in a closed-containment system in a former dairy barn. Water is circulated among 24 large metal tanks, each containing about 5,000 fish, and a sophisticated filtration system using RAS (recirculating aquaculture system) technology. The farm is completely bio-secure, and no waste water is released into the environment.